If you are looking for a unique mountain getaway experience, you have found it! This is the place where family quality time, fun and memories will be made. 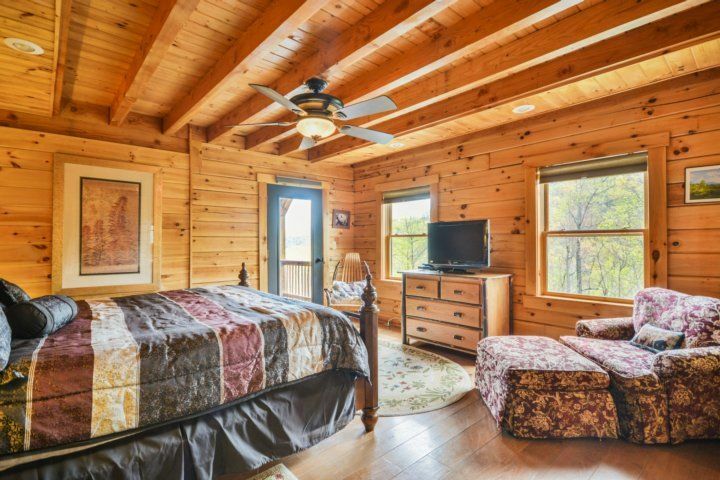 This immaculately maintained 4200 square foot, 3 level, custom log home will meet and exceed your expectations for a mountain vacation. This is our 6th season of offering the premier vacation destination in the Asheville/Black Mountain area. 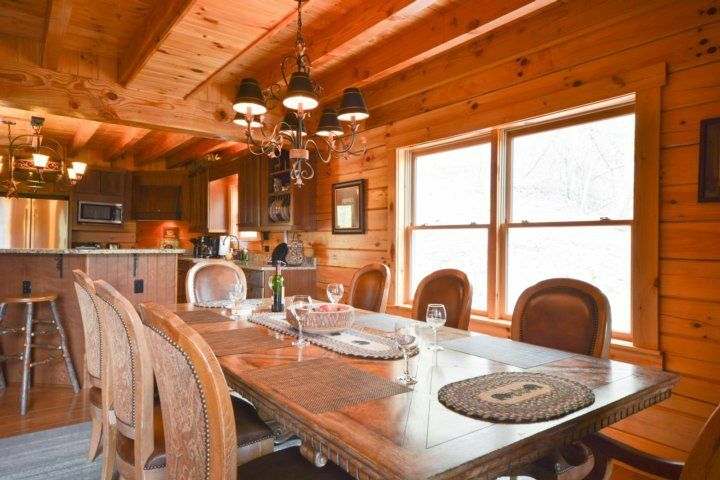 The home is located in Catawba Falls Preserve, a gated mountain community preserve with paved roads located just 8 miles (15 minutes) from the town of Black Mountain and 23 miles (30 minutes) from Asheville. The community backs up to the Pisgah National Forest and is the home for an abundance of wildlife including black bear, deer, turkey, birds and many other animals. 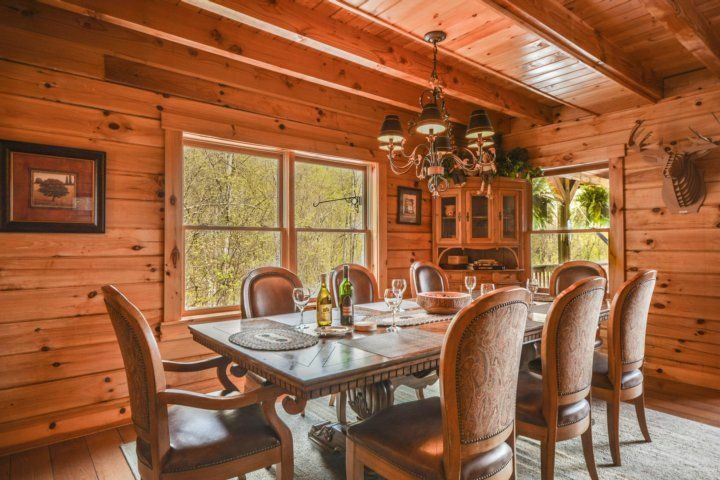 This home is set up perfectly for 2 families or multiple couples to vacation together. 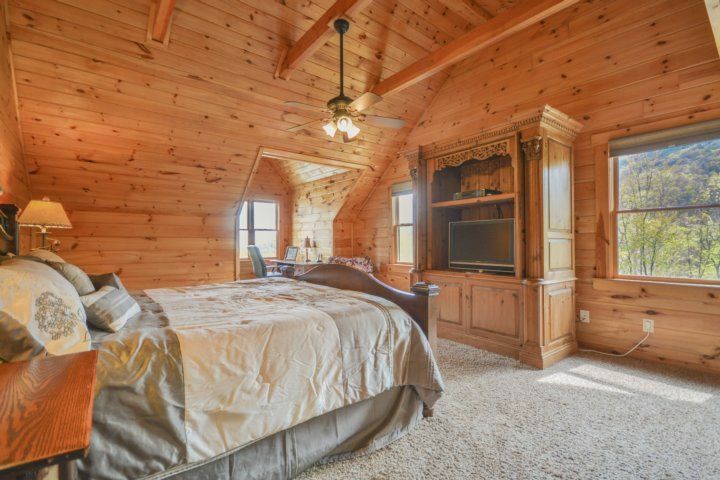 There are two king master bedroom suites on levels two and three. 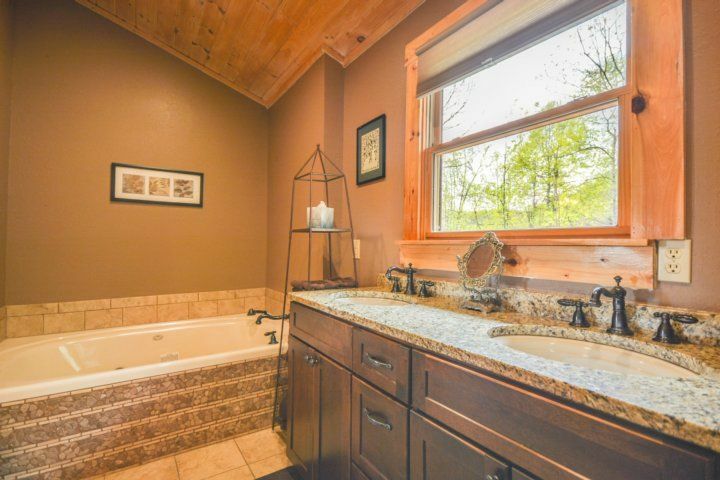 Each master suite has a large jacuzzi tub, double granite sinks, and a walk in shower. 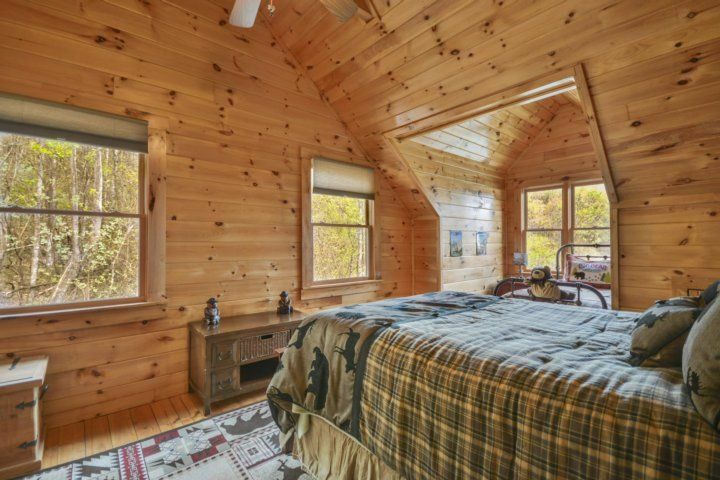 Bedroom 3 (the bear room) on the upper level can be a third master suite with a queen bed and a twin bed with a full bathroom with a tub and two sinks. Bedroom 4 on the lower level has a queen bed, a sofa and one twin bed. Bedroom 5 (the bunk room) on the lower level has a bunkbed and a trundle bed. 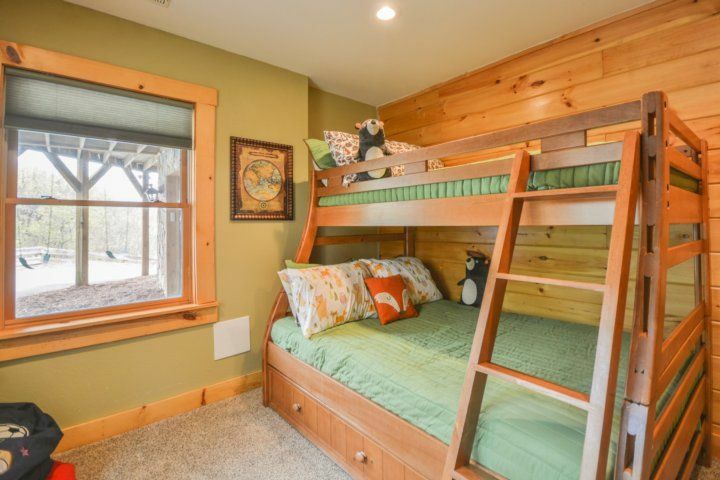 This bunk room has one full and 2 twin beds and is perfect for the kiddos. The home can accommodate 13 comfortably in beds. There are 6 TV's in the house connected to DISH satellite. All the bedrooms (except the bunk room) as well as the great room and the game room have TV's. The wifi internet is through the satellite and is fine for web surfing and checking emails. 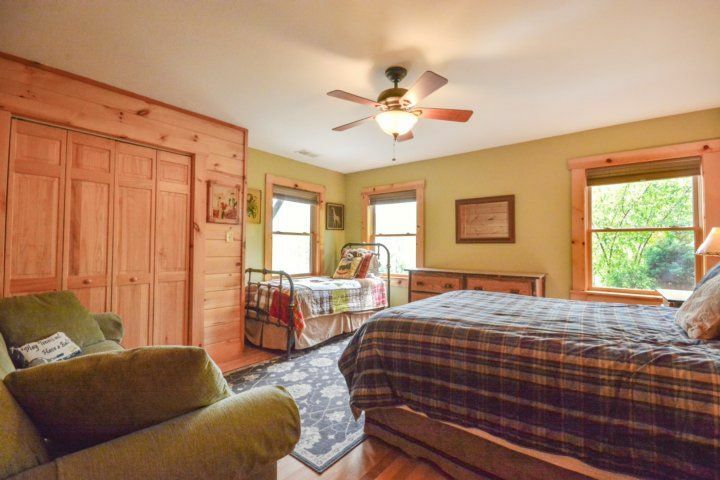 Much of the house cabin decor was acquired locally in Black Mountain and Asheville and the great room was refurnished in 2016. 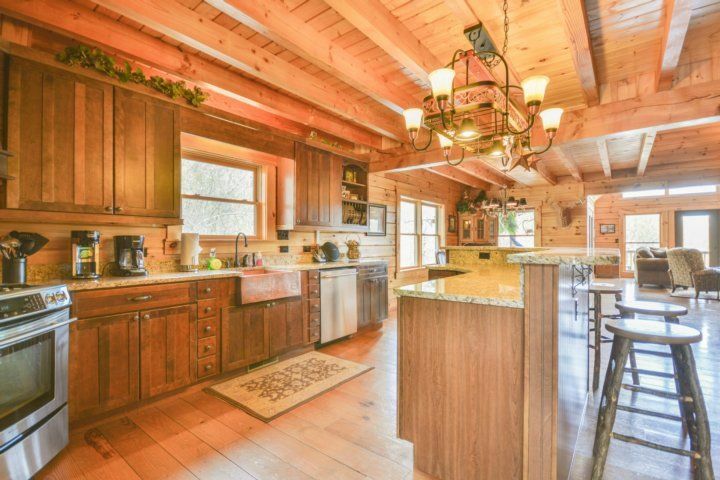 The property is very quiet, peaceful and private and sits on 2 acres with breathtaking views all around. The deck wraps around with plenty of seating and relaxing in the hammock and swing chairs. There is a large back deck for entertaining with a hot tub, BBQ, table with seating for 6, cozy outdoor furniture and even a fire pit. Behind the deck, there are stairs leading up to swing chair to enjoy those amazing long range mountain views. The amazing outdoor spaces are the place for relaxing and enjoying the mountain views and listening to the sounds of nature. The game room is where the fun is! 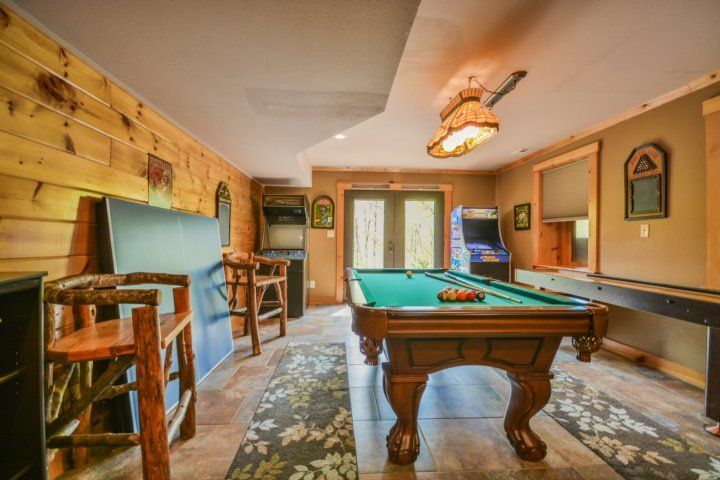 You will love entertaining and watching the big game here with a pub style wet bar featuring a pool table, ping-pong, 1 arcade game, TV and shuffleboard. There are also 2 Bose bluetooth speakers in the house that you can connect your devices to for your music. Your kids will not be bored at this house! For nature lovers, there is hiking, waterfalls and abundant wildlife in the Preserve. 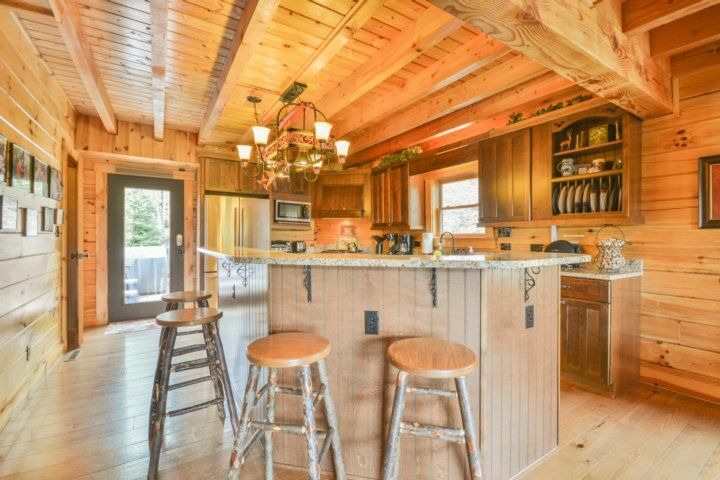 The home and kitchen are very well stocked with all your basic supplies needed for your vacation week. The beds are all made up prior to your arrival and we provide towels and linens. We keep our availability calendar up to date. Please check our calendar before inquiring about availability. We usually respond to all email inquiries right away or within a few hours. If you inquire by phone and there is no answer, please leave a message with the dates requested and any other details and we will get back to you as soon as possible. 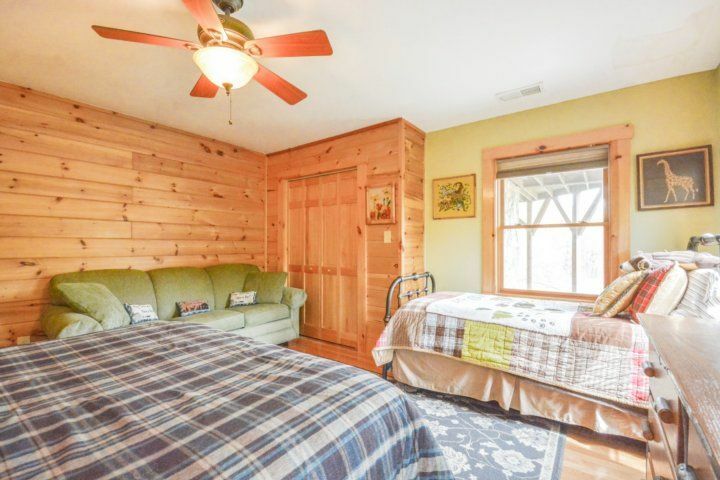 We have a 3 night minimum requirement in the off season (Sept, Nov-May excluding holidays and spring break) and a 7 night minimum in season (Memorial Day through Labor Day and October with a Saturday turnover) and all holidays and spring break. Please do not inquire for less than 3 nights. Please check out all of great 5 star guest reviews. This is our 6th season of vacation renting and we continue to maintain, upgrade and add amenities to our home for our guests' based on their recommendations. This house truly is a one of a kind mountain experience. We make it very easy for our guests so they can enjoy their vacation. 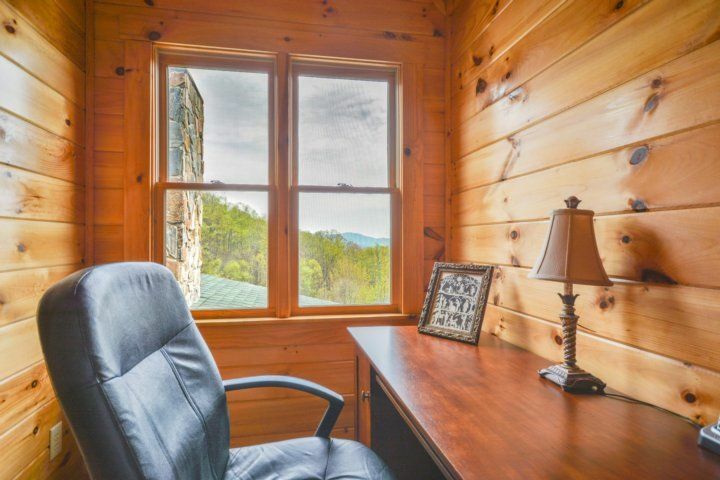 Thank you for considering our log home for your mountain vacation. Enjoy a really unique getaway. You will feel away from it all yet you will be only 15 minutes (8 miles) to Black Mountain and 30 minutes (23 miles) to Asheville, NC. Why the Owner Chose Black Mountain: After living in South Florida for 20 years, we searched for an escape up in the mountains. 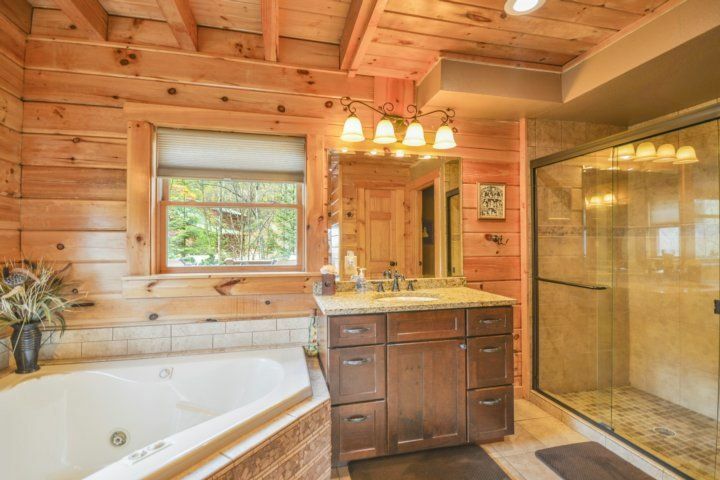 We built this custom log home in 2007 and vacationed in it for 2 years. We enjoyed this incredible lifestyle so much that we decided in to move to Asheville in the summer of 2009. We briefly lived at the lodge and really enjoyed it. We have since opened a medical office in Asheville and need to be close to the practice as well as the kid's school. That is the reason we have now decided to offer this incredible property for others to enjoy. 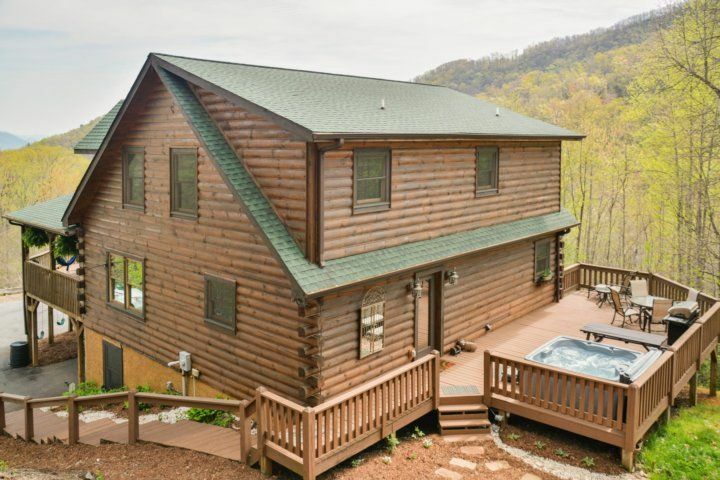 We know you will love this property and the breathtaking mountains as much as we do! 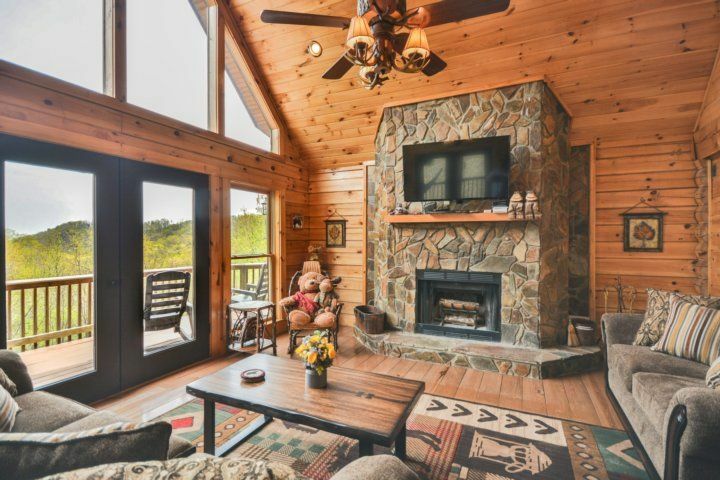 The Unique Benefits at this Lodge: Bordering a vast forest preserve, Catawba Falls presents gated acreage homesites with stunning views of the Pisgah National Forest. 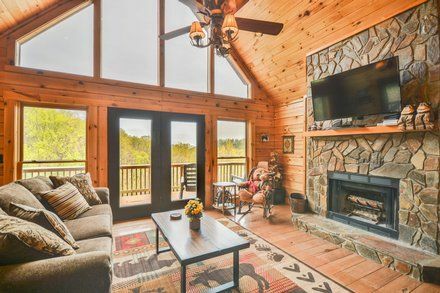 You'll feel a thousand miles away in your mountainside dream vacation home, yet you'll be minutes from the culture and conveniences of Asheville and Black Mountain. There are numerous hiking trails, streams and rivers, and waterfalls nearby. Wildlife is abundant in the Preserve. The most common animals that you may encounter are deer, wild turkey, rabbits, birds, fox, and black bears. Of course, there is absolutely no hunting in the Preserve. If this property is unavailable, we may have others available. We manage several similar 4-5 bedroom homes in this community. Michael Masterman Show Phone No.